.....and, he actually said I could borrow it, so I took him up on it and went for a ride. I had a bike at home, but we missionary kids in boarding school could not bring a bike to school. But the school staff's kids could have bikes. Rank has its privileges I suppose. Now, my bicycle rides in the Kenya Highlands were never planned. I got on the bike, and as I rode away, a plan presented itself. Why the staff did not insist on knowing where we were going is easily explained. We lived in an era when adults were not obsessed with nannying kids all the time. I feel sorry for kids today. They are now considered too dumb to take risks and survive. Then again, we also were clearly told that there are consequences, and we knew we were to blame if we did something dumb. Life in Africa did not come with 21 labels and warnings. On this Saturday I rode up the lay of the land on Kijabe mission station, leaving RVA behind and fading into memory. It helped to still have the imagination of a kid, and somehow I was endowed with way too much imagination. It showed in my grades, but it also lent me vistas of experience many kids never found. Any kids reading here, I challenge you to get away from this computer and wander. Hey, stupid, I don't know where. Don't ask me that. Just go wander somewhere and see the stuff God made. I have never believed in "find yourself." I also thought Thoreau's "know thyself" was madness. What a waste of time. I always knew right where I was, and I was very suspicious about WHO I was, so it seemed to me that finding some other person in some other place would be a lot more interesting. On this Saturday that was exactly what happened. The mission station rose pretty steeply if you were on a bike, so I had to shift down and peddle standing up a lot of the time. It had rained the day before, but I was able to find dry ground most of the time because the sun had been out. When I reached the railroad tracks I turned right and rode along side the tracks above the African church, the hospital, and the African schools. A few African students were walking about, and I greeted them in Swahili and we exchanged a few words in passing. The road along the railroad tracks turned left and went through a tunnel under the tracks. After only a hundred feet I was in the forest, and the road got steeper. It also got slicker because the trees hung over the road and shaded it so that it did not dry fast. The wheel spun over and over, slipping on the red clay, and I peddled faster. I got tired pretty quick. The red dirt of the Kiambu highlands above Kijabe was slick when it was wet, and when the wheel spun it flipped a fine spray of red mud up in the air and gave me cool racing stripe up the back of my shirt and the back of my head. The hills right above Kijabe mission station today are still solid forest, but the top of the escarpment has been stripped and is solid farm land. The photo shows you the red color of Kenya Highlands roads, but the road in the photo is a super highway compared to the road I was on in 1958. This wet red clay, and other such decorations on other kids' clothes during the rainy season, kept a whole crew of Africans employed in the school laundry. Mrs. Hollenbeck, Bobby's Mom, ran the laundry, and she often scolded us good naturedly about the red mud. One day I was behind the laundry where the drain water came out, and it looked like red paint pouring forth. I recall deciding that Mrs. Hollenbeck must be a pretty nice lady to put up with that job. Well, on this Saturday I was making lots of job security for the laundry help. As the road rose up the hill it got steeper, and low gear was now working. I was totally winded, and because of the slippery road I was not getting very far. So, I got off and pushed. You can cover a lot of miles in Africa if you don't mind pushing part of the way. Then, there was level ground for a while, hop on, and peddle. Off again for another push. This went on and on. I came to the point I knew was the farthest I had ever hiked along this road, and I had to decide if I would go on and violate a Principal. That is not a misspelling. 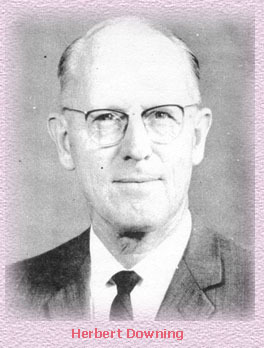 Our Principal, Pa Herb (see photo), had told us that the Mau Mau Emergency was over, but we were not to go up on the hill or to Kijabe township until further notice. I will tell you about my venture to Kijabe township another time, but on this Saturday Pa Herb seemed to be far away, and the road kept on going up and up. I seemed only logical to go just a little further. Switch backs were not a surprise, for the highlands had thousands of them, but as I pushed the bike back and forth up the switch backs I wondered just how it would be to come back down the slick road. I could hardly stand up while holding the bike. Finally, I came to the top of the hill, and there was a wide road running east and west along the top of the ridge. It was destroyed by trucks (lorries) which ground through the mud and made the road a total chaos or ruts and gumbo. The photo is of Herb Downing, RVA principal during my sentence there. Now, I had heard of a tiny village up in this neighborhood where there were some small dukas (shops), and they had slowly become a vision of my final destination as I progressed. I was now eager to find it, and there at the "T" of my red mud road was the a sea of a black mud..... the main road. Why the color change of the mud I do not know. This road is now called A104, and is a high speed paved highway. You can see the surrounding area on Google here: -0.940880, 36.620173 . All the area, in 1958, was solid forest. (Hit the satellite icon to see the lay of the land). 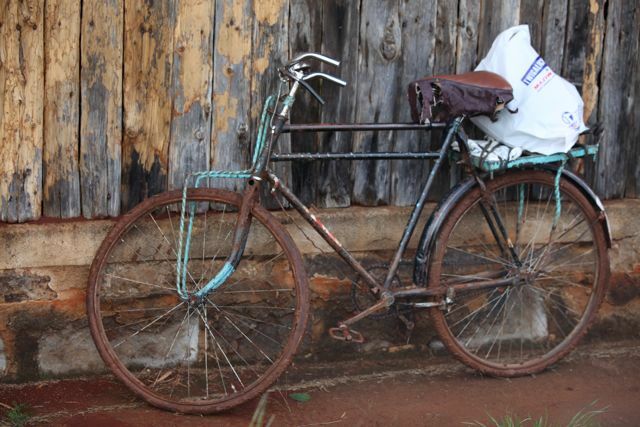 There was a little African Kikuyu man standing by the road watching me struggle up the last few feet peddling like a mad man as the rear wheel spun wildly and sprayed mud everywhere. The little man smiled. That felt good because it meant someone up here had a merry heart. Hopping off the bike, I politely greeted the little man, and we started walking along eastward. I asked if there were dukas (shops) around, and he said he owned one nearby. Wow! Just like that I had found the legendary little village that my friends thought was up here. We walked along for a while and came to a huge two axle truck stuck in the mud up to its chassis. The driver and his helpers were all over it chattering and deliberating in the Kikuyu language which I could not understand. 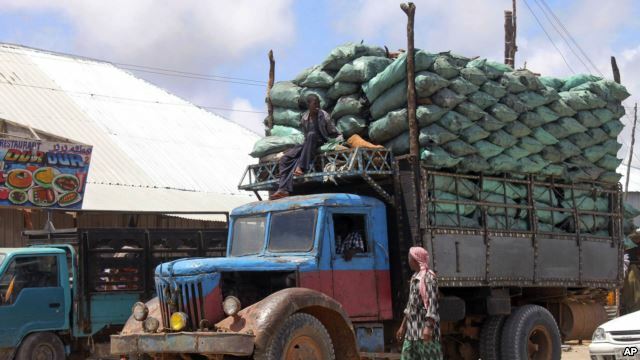 The truck was way overloaded with bags of charcoal, a local commodity that made the Kikuyu good money when transported to the capital city of Nairobi. The men were obviously agitated with the mud and each other. I looked at the little man, my new companion, and he had a concerned expression on his face. Hmmm, what does that mean? Now, I need to explain something. The Mau Mau Emergency, a terrorist uprising, had lasted from about 1952 to 1957. During that time a gang of Kikuyus called Mau Mau had grown to huge numbers and had tried to terrorize the British so they would leave Kenya. The British rose to the occasion and fought off the rebellion. Many Africans who refused to take the Mau Mau oath were killed by their own people, including many Christian Kikuyus. Also, the Mau Mau killed a fair number of British farmers in the Kenya Highlands. Rift Valley Academy, where I went to school, was right dead center in Mau Mau territory, and we were guarded by a troop of the King's African Rifles and lived behind barbed wire and bamboo pungi sticks. You can read more about this frightful era HERE at this journal. 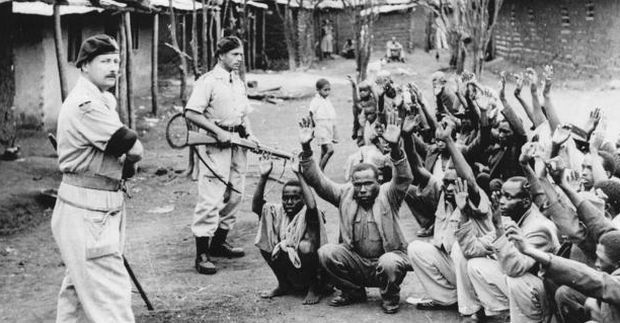 The photo shows Mau Mau terrorists who were caught by the King's African Rifles soldiers. Well, this was 1958, and the Mau Mau "Emergency" was official declared over. The Mau Mau had supposedly disbanded. The barbed wire came down, and the African British guards went away, and life went back to normal, sort of. We were told there were many former Mau Mau in the area who had returned to normal life, but they could still be dangerous. That is why our principal, Pa Herb, wanted us to stay near the school. I only learned recently, about sixty years later from a book on the Mau Mau era, that there were Mau Mau who were in those forests until they received amnesty from the British Government in 1962. Keep that thought please. So, the Africans on and around the truck began shouting at each other rather impatiently trying to discover a plan to get the truck out of the mud without unloading it. A Kikuyu fellow on top of the load looked over at the me and the little man and yelled at me, "Hey, White boy, you think you are smart, tell us how to get this truck out of the mud." His voice was bordering on ominous. I glanced at the little man again, and his face had gone from concerned to grim. I had an Apostle Peter moment-- "Lord save me...," and the light went on-- prayer answered. 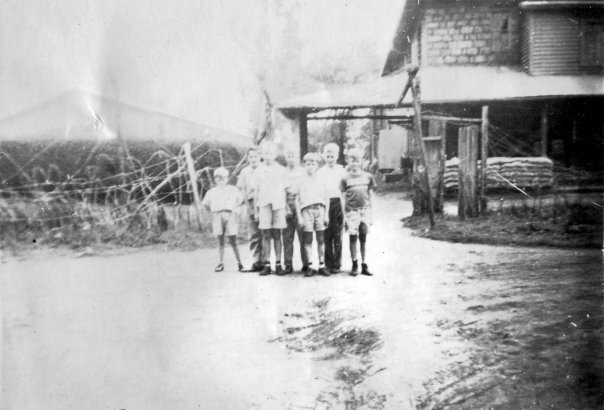 The photo shows the school and the barbed wire fence during the Mau Mau era. When I was at home on vacation in Tanzania, the nation just south of Kenya, my Dad and our family often went to the nearest city over a couple hundred miles of horrid black cotton soil, and in the rainy season that stuff was treacherous. For some reason this road I was walking beside in the Kiambu was also black soil, not the usual red clay. The thing I learned in Tanzania was the amazing usefulness of a jack invented in Africa by some clever soul called a "Tanganyika jack." Tanganyika was the name of the nation before it got independence. If we got stuck in the mud badly, we would drag out the Tanganyika jack, jack up the truck by the rear bumper, or by the deck if it was a flat bed truck. The jack was a monster and almost too heavy to carry alone. It was made of hard wood with steel reinforcements, and was about five feet tall retracted. We jacked it up as far as the jack would go, and that lifted the truck as much as six feet in the air. This meant that the rear wheels were way clear of the mud. Then, we would push the truck off the jack forward so that the rear wheels landed out of the hole on the level surface. We had cut brush and laid it where the wheels would land, and this usually gave the traction to get out of that hole and on down the road to the next hole. 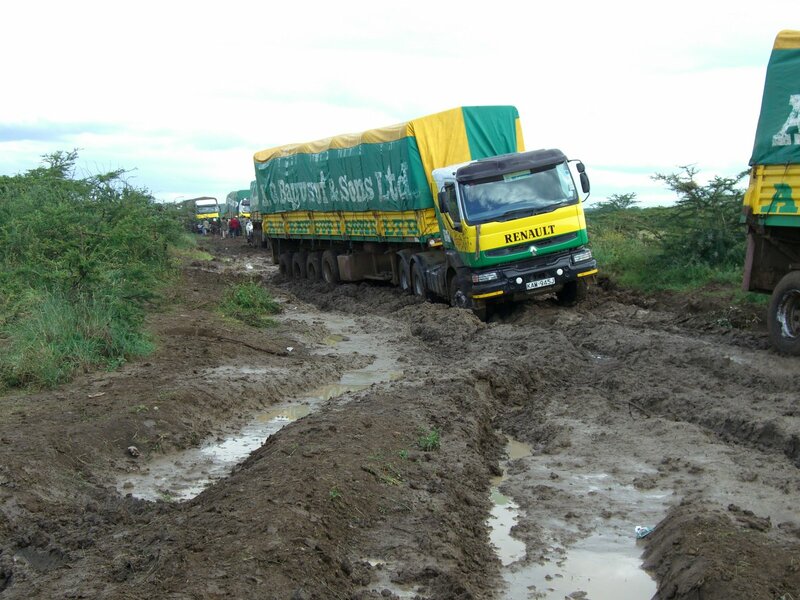 The Kenya road and mud are at the right, but the truck shows this is a recent photo. I asked the guy yelling at me, "Do you have a Tanganyika jack?" He said they did. I told him the technique to lift the truck, cut branches, and then push the truck off of the jack so that it landed on the branches, and then they could get going again. He suddenly saw the light and told me I was a smart White boy after all. I was feeling pretty clever. Then the old man tapped my arm and said, "Twende pesi pesi." That means, "Let's get out of here." Then it hit me, what if the truck just falls back in the hole? The White boy had no contingency plan. I grabbed the bike and started pushing pretty eagerly and chattering in Swahili with the little man. He kept urging me to keep moving. I also realized the old man was worried about this White boy, and the old man may have known something I did not..... that testy fellow yelling at me could have been an ex-Mau Mau. I pushed faster. Actually, there are memories from your youth that seem embedded mightily in your memory, right? I can still feel the slow panic rising when I sit still and remember that moment. The photo looks exactly like the charcoal truck I saw that day. We came to a narrow path which turned off the main road to the right and went back down hill. The little man led me down the path. After a while, we suddenly rounded a corner, and there before me was indeed a tiny village with maybe only three of four dukas (shops), and the little man relaxed. This was his world, and by his age I gathered he was the patriarch of the village. He invited me into his duka, and I sat down on an African hand made chair at a hand carved table. The smoke of eucalyptus wood smoldering filled the air, and I slowly and totally sank into Africa, my Africa. You can "find yourself" if you like, but I would rather find an old Kikuyu men in the Kiambu and have tea with him any day. I find myself rather boring. 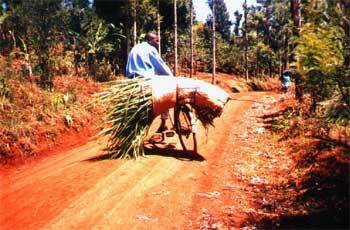 The village in the photo is very typical of Kikuyu villages in the Kenya Highlands. The little man called to the ladies in the back yard, and the tea pot was put on the fire. I forgot the "the terror by night; nor for the arrow that flieth by day." God had delivered me from whatever the little man was worried about. We both set about, I in my lousy Swahili in which the grammar was all improvised, and the little man in his lousy Swahili because it was not his tribal language, and we had a splendid time and both thought we were communicating very well. Who cares about the tense and the diphthongs if you understand each other? Why could I get on with the little man so well? It was NOT because he feared me because I was White, nor was it because he owed me anything. It was because my Dad had hammered it into me that I was no better than the Africans around me, and I was chastised regularly by Dad to be polite and considerate to Africans, especially older man. Though I was only in ninth grade, I had learned that this plan won over the kindness of many African men old enough to be my father, and I also learned fantastic things about life long ago in Africa by asking questions. I still do that. To blazes with Wikipedia. 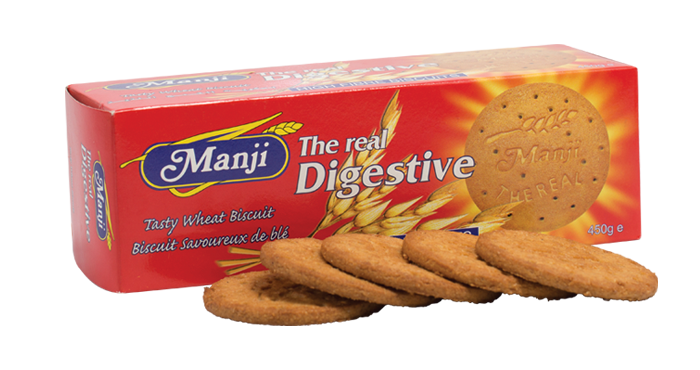 The tea came, and along with it digestive biscuits made by the House of Manji in Nairobi just like the ones in the photo. Cool! I love digestive biscuits. I also love African tea. It is strong, thick with sugar and heavy cream, and with a touch of smoke from a Kikuyu kitchen smoke. These biscuits are great for dunking, just don't hesitate, or you will have wet digestive biscuit in your lap. We sipped tea, dunked biscuits, and learned much about each other. We moved on to some of the matters of the world at large, but here in this tiny village tucked into the green forest of Kenya, the rest of the world seemed a bit dull. I do not recall what his questions were, but the old man would have asked me a number of questions about America. I would have tried to answer them by using African imagery so he could visualize something rational. Trying to describe the Statue of Liberty while sitting in the Kenya Highlands is a challenge. Life is good. I was so blessed of God, for I was a naughty boy and deserved very little mercy from God. And, God gave me the desire of my heart. It was time to return to the school which seemed a million miles away by now. I told the little man I needed to go, and he told me to take a different path down the mountain which would connect lower down with the red dirt road I had come up. This would let me avoid the possibility that the truck with the bad tempered Kikuyu might still be stuck in the mud. This path was a bit narrow, and I barely fit between the bush and trees, and it was rather deep, so the bike slid along on the red dirt without wandering. The trick was to use the brake to stop the rear wheel occasionally to slow down. I used my feet for out riggers. Where the path switched back I fell off a couple of times, and each time my shirt and trousers went more and more from kakhi to red Highland clay in color. 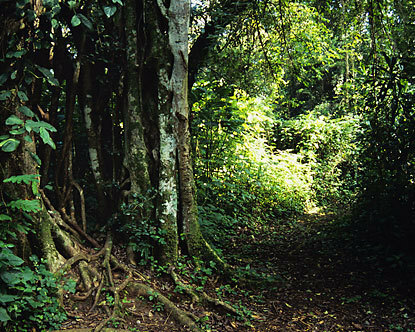 This path also ran through dense forest, and this area was noted for leopards. I got the creepy crawlies for a while, and I resorted to an African trick. I sang and made lots of noise so that any leopard would hear me coming and leave. The worst thing you can do in that forest is surprise a leopard. They take umbrage at surprises, and there have been many people attacked because they thought being quiet was the way to go. There were also stinging nettles hanging over the sides of the trail, and I had to try to get by without letting any bare skin touch them. Animation is a skill that comes rather naturally after you live in Africa for a while. This photo looks exactly right except the path would have been more used. This may actually be a game run. I was a mess, and then I hit the red dirt road. The road was really slippery, and I was all over it and sideways a few times, and dumped a few more. By the time I reached the railroad tunnel I looked like a Shermin Williams paint swatch panel, like the one in the store where you try to pick the color for your new living room. As I peddled along the road at the top of the mission station the Africans I met stared and then chuckled. A couple of African girls in their walk-about best clothes jumped back in terror as I flew by spitting red dirt in all directions. I then realized that if Bobby Hollenback, or especially his Dad, saw the bike as it was that I would never get to ride it again. The bike must have doubled in weight from the red mud crammed into the fenders and every nook and cranny. I had to sneak into the school area very carefully and find a faucet with a hose. That worked fine, and the bike was spotless in a few minutes. But, as I pushed the bike back to where Bobby Hollenback parked it kids looked at me in wonder. I was covered with red mud, but the bike was spotless. Well, Bobby was not around, and the bike was no worse for the venture. I went to my room, and my room mates stared in shock. I looked like I had had a fight in the mud with a Missouri hog, and the hog had won. Had I done that on purpose? What a great job I had done, and they just had to know how I had gotten so much of the red badge of courage all over me. The bike in the photo shows the mud color, but the one I rode had a lot more mud on board. "Oh, I just went for a little ride up the hill and back." No one has ever learned this out in the great world at large except my wife and kids. So, now the present Principal of Rift Valley Academy may want to print this out and drop it in my file. I may need a bit of retroactive rebuke for going a bit, just a bit you see, farther than I should have that Saturday in 1958. And, to Bob Hollenbeck, wherever you are, I think I owe you pie and coffee to compensate a bit for the wear and tear on that bike of yours. None of us kids had a bike, and you loaned your bike way too much. So, I hope someone has thanked you for that because you made life a lot more interesting for some of us.